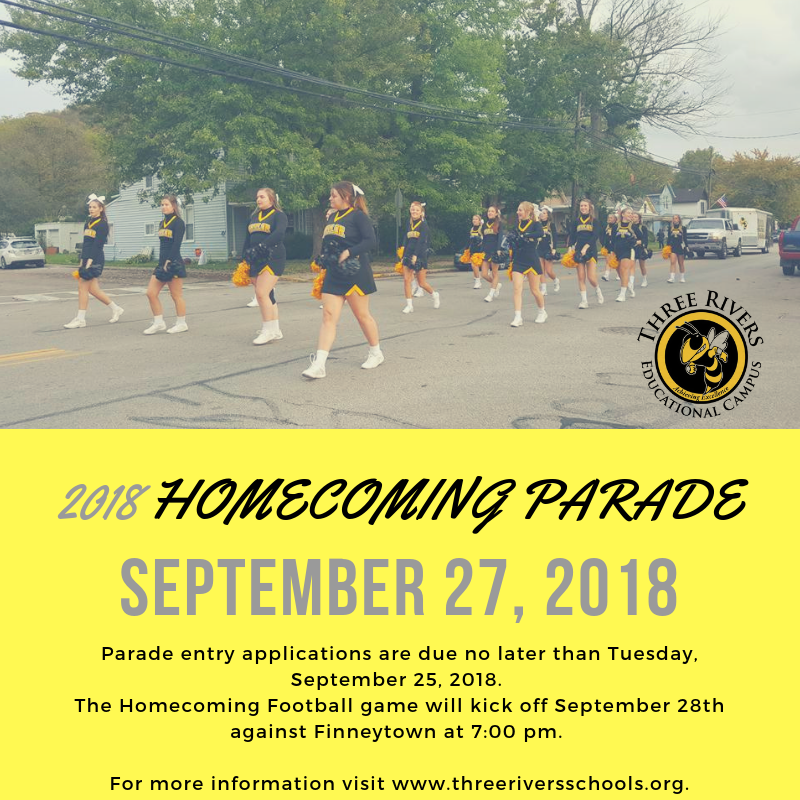 On Thursday, September 27, at 5:30 PM, the Taylor High School Yellow Jackets will kick off our 2018 Homecoming celebration with our annual parade. The parade will be followed by the Student Council Powder Puff games in the stadium. The theme for this year’s Homecoming Parade is “Masquerade Ball” - so each group is welcome to join in and design your entry around this theme! We would like to personally invite you to come out to join us for this year’s parade. We will be staging at the land of the old Taylor High School student parking lot (now St. Joseph church’s overflow lot) at 4:45 PM and will line-up at 5:00 PM. The actual parade will leave promptly at 5:30 PM and arrive at Three Rivers Educational Campus approximately one-half hour later. No items, including candy, may be tossed or thrown from vehicles. Any items that are being handed out must be distributed by participants who are walking in the parade. Officials running for office are not permitted to campaign in the parade. Current officials may participate, but also must adhere to the no campaigning rule and not display any campaigning propaganda. On Friday, September 28, the THS Yellow Jackets football team will kick off against Finneytown at 7:00 pm. If you would like to participate in the parade, please complete the ATTACHED APPLICATION and return it to Taylor High School no later than Tuesday, September 25, 2018. Please feel free to make copies of the form if necessary. If you cannot participate in the parade on Thursday, we hope to see you on Friday for kickoff at 7:00 PM in Yellow Jacket Stadium against Finneytown. If you have any questions, please contact our office at any time. Thank you for your continued support.